The April showers are in full swing here in Indianapolis! We’ve got plenty of brightly colored goodies to shower you with handmade happiness until the gray skies clear and those beautiful spring flowers all show their lovely blooms. New seed bombs from Visual Lingual will make your spring and summer bright this year! 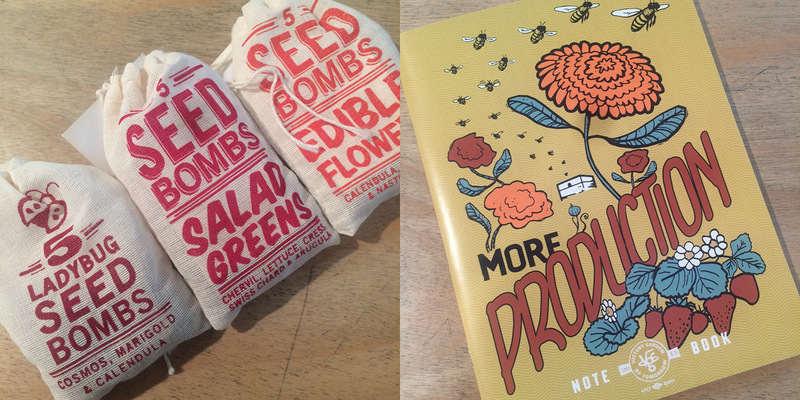 Take notes about what you plant where with this nostalgic spring notebook from The Victory Garden of Tomorrow. 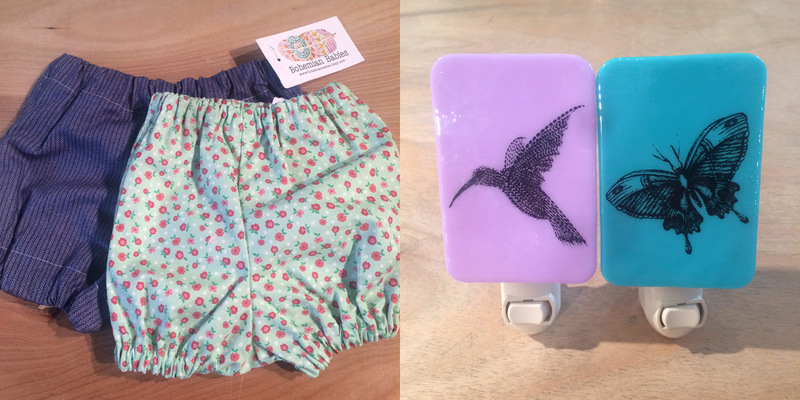 Get your littles into the springtime spirit with these sweet bloomers from Bohemian Babies. Spread a little light in their rooms, too, with a brightly colored night light from Dulcet Design. 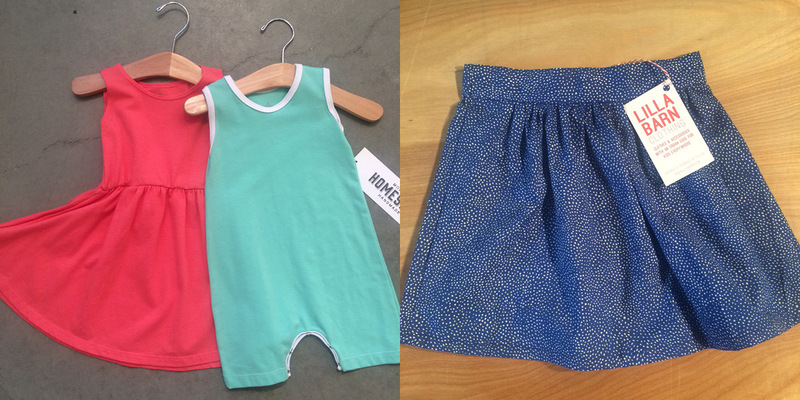 More apparel to keep your babe cool and stylish: dress and romper from Little Hip Squeaks and skirt from Lilla Barn. 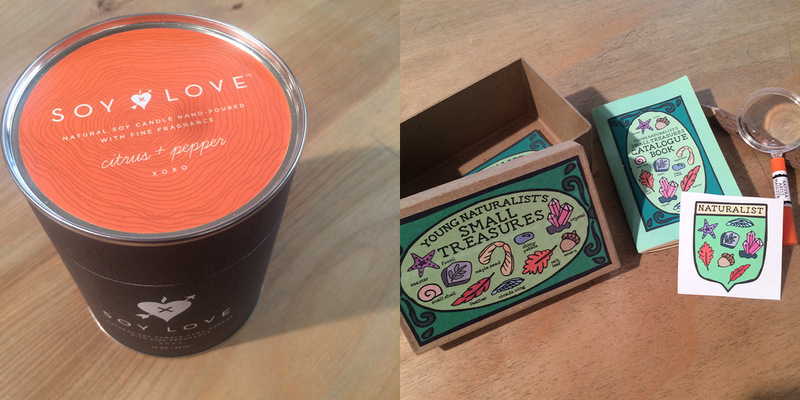 When you can’t open the windows, bring the outside in with this light and fresh scent from Soy Love candles. When you can venture outside, bring a Young Naturalist’s kit from Jean Elise Toys to keep your little adventurer busy. 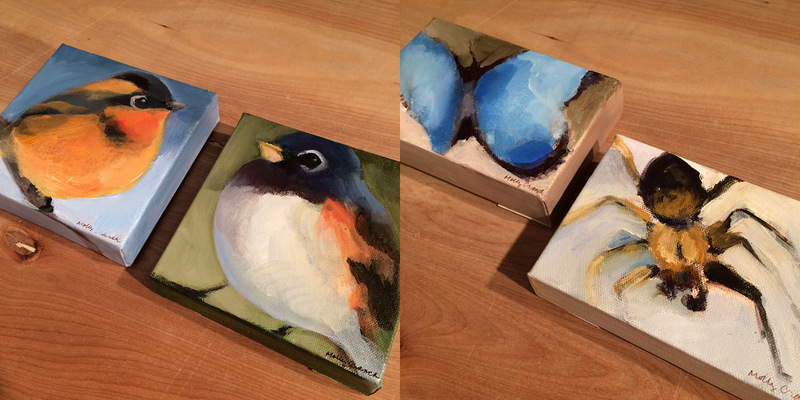 Lots of beautiful little paintings are available from artist Molly Cranch. They capture all of the spring time wildlife perfectly! 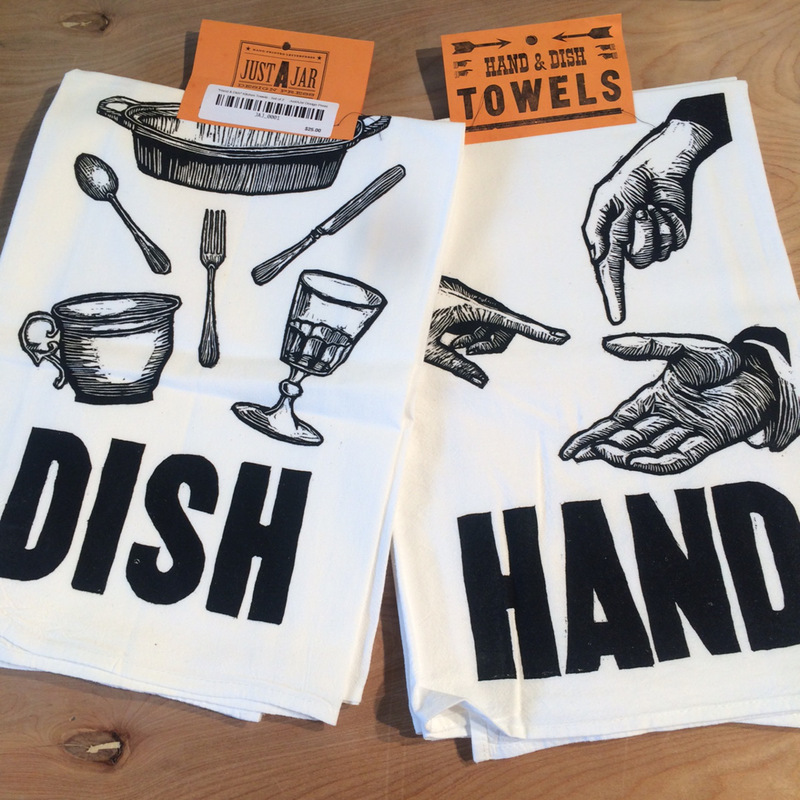 Cheer up your kitchen with easy springtime accents like these tea towels from Artgoodies. 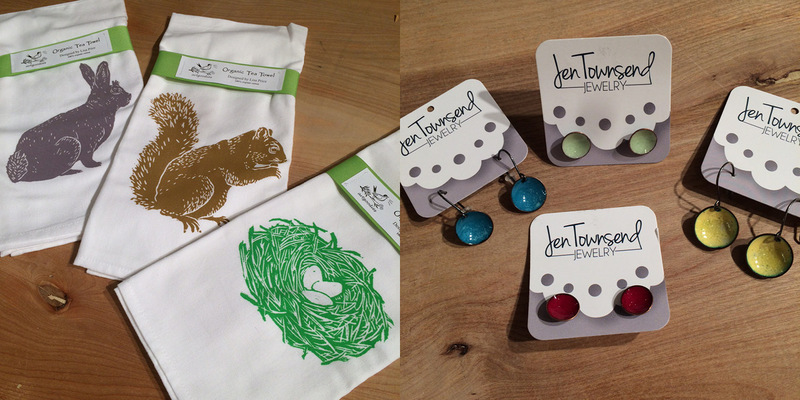 Jen Townsend’s jewelry seems made for spring with her line of bright, shiny earrings and necklaces. One word this week… PICKLES. 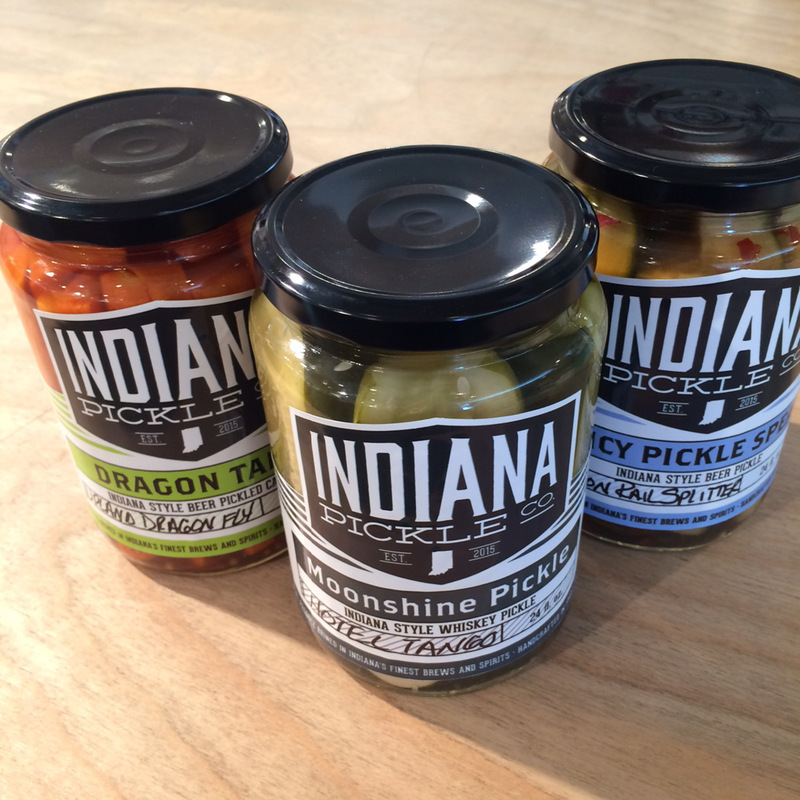 We just got pickles from Indiana Pickle Co. and they have WHISKEY IN THEM. I can’t think of a better reason to have a picnic. Crisp, cold, delicious pickles on a hot day! Just imagine. If you’re able to continue walking past the pickle shelf, we have lots of other beautiful products, all delicious in their own ways, waiting to make your day. Check it out below, and take a look at what’s coming up on the Homespun schedule. Also, we’re hiring! New products in from Richmond Creations. Hand shown for size, these are some whopper coasters! 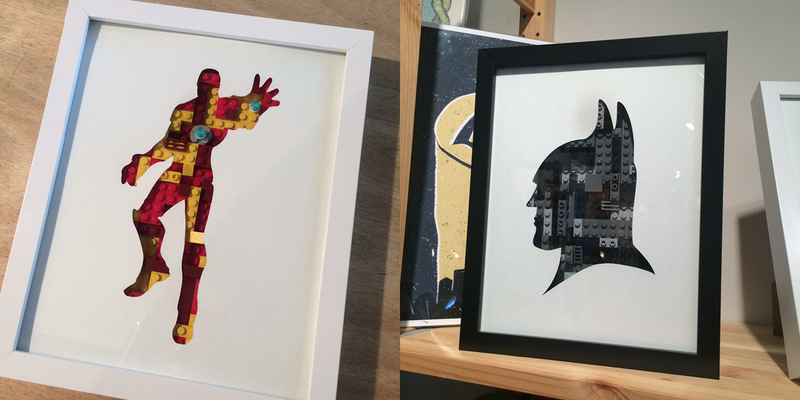 Lego art new from Smitten by Kat. All kinds of super heroes and Star Wars images to choose from. Fresh wire headband from Little Minnow on the foam lady now, love this geometric pattern! 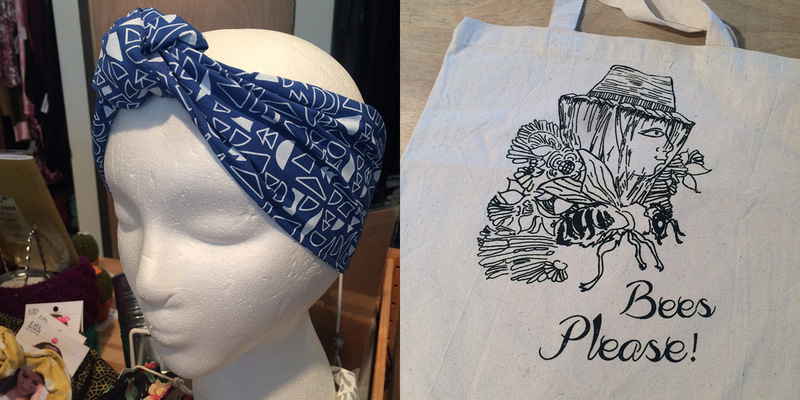 New totes from Bee Public, too. 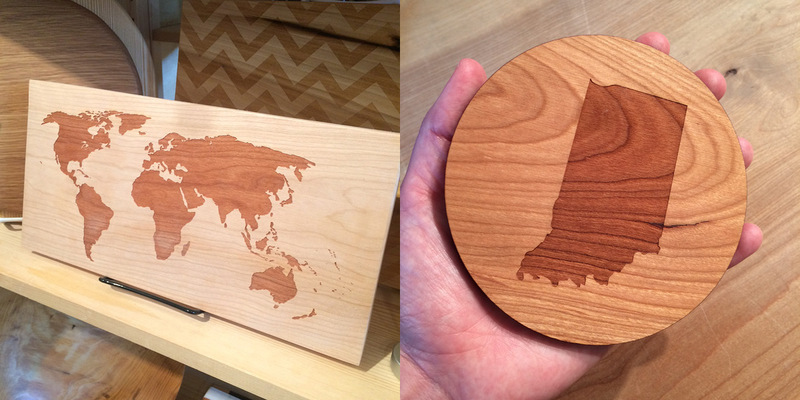 Love this little gift box we put together. 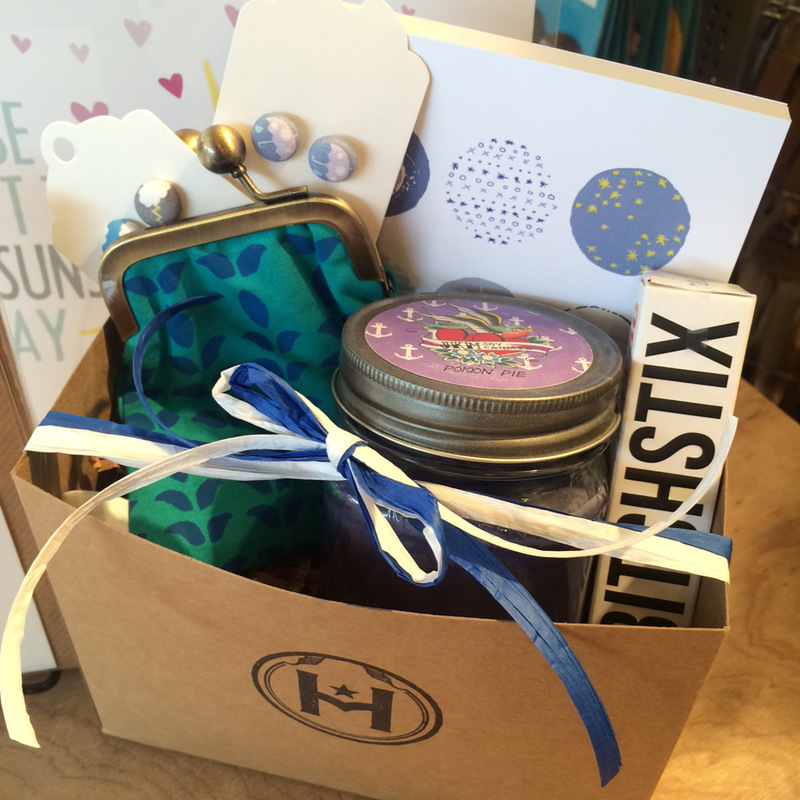 We’re hear for you and all your gifting needs! 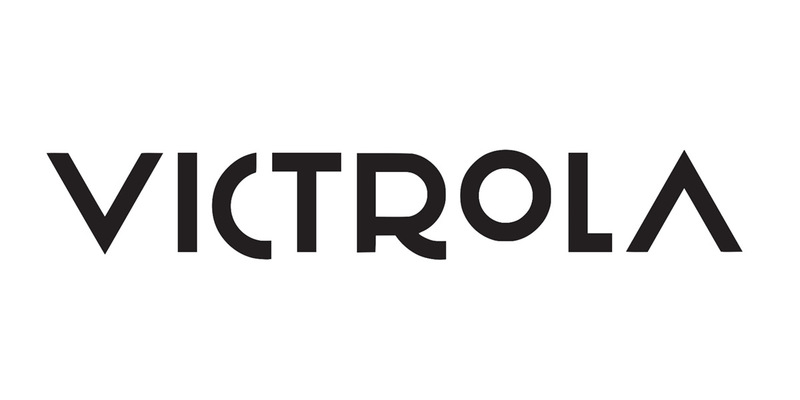 Are you an innovative spirit with a desire to constantly improve systems & procedures? Are you positive & friendly at all times? 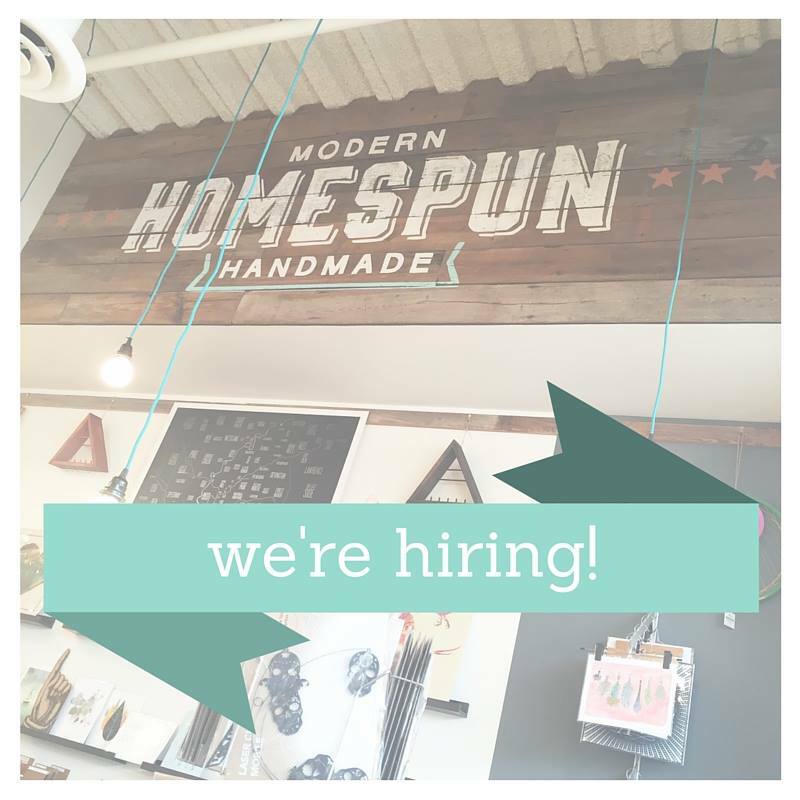 Homespun is currently accepting applications for a Sales Floor Manager! The right candidate for this role has previous customer service experience, leadership/management experience, time management & organizational skills, and some college-level training. 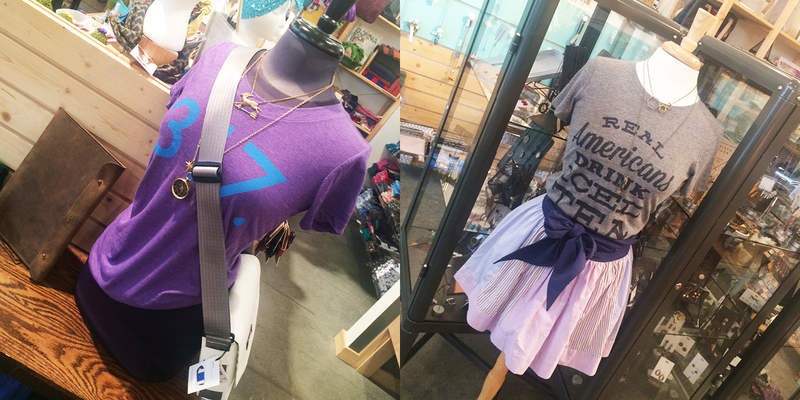 Knowledge of visual merchandising in a retail environment is highly desired, but not required. Upon hire, the sales floor manager would be responsible for employee training and development, opening & closing the store when scheduled, working off-site events when necessary, and general administrative support to store owner as needed. This role directs all sales floor operations, including cash handling, visual merchandising, and daily/weekly operational tasks. If you’re interested in this position, come in during store hours to fill out an application and drop off a résumé with three professional references. 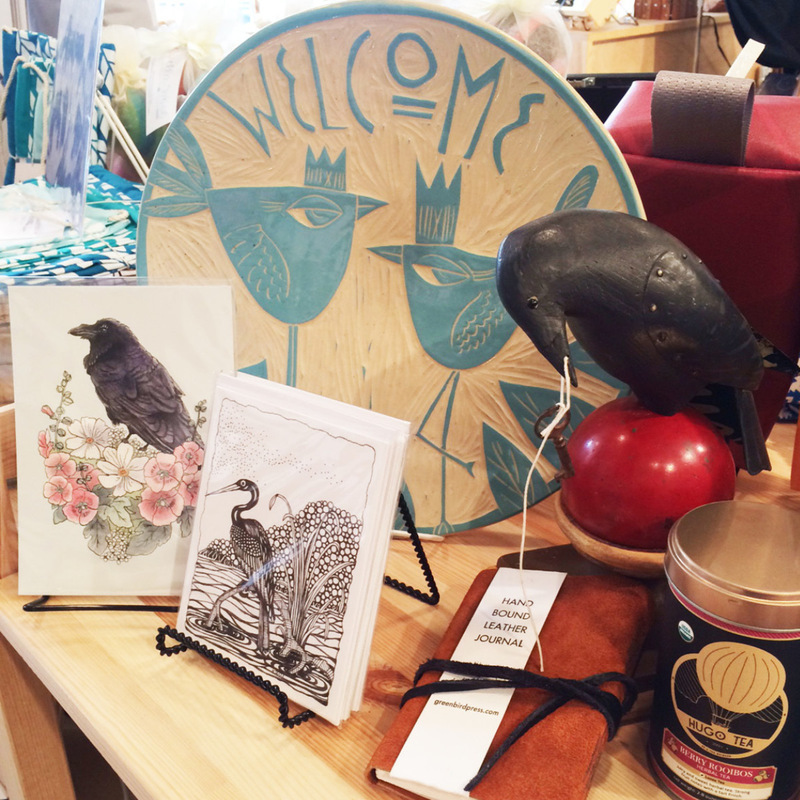 First Friday Celebration: Friday, April 1st, 6pm-9pm: Every month Homespun: Modern Handmade hosts a celebration in collaboration with iDADA’s First Friday events. Our shows change every other month with various artists showcasing work in painting, illustration, photography, ceramics, and so much more. For the months of March and April, the work of Grace Beck will be displayed in our gallery space. Grace is a graduate of Herron School of Art and Design, where she is currently employed as the sculpture technician. Her drawings will be on display and for sale in our store. Workshop: Mixed Media Junk Journal: Thursday, April 14th, 6-8pm: Do you ever feel like you have artists’ block? Maybe you’re an out-of-practice creative wanting to get back in the habit? Perhaps you have the creative spark, but you’re not sure where to start? We’re here to help! Join our Mixed Media Junk Journal Workshop to get your creative juices flowing. Play and explore design ideas through a variety of materials and mediums. See ya next week, friends! 1| How do you describe your work to people who don’t know what you do? My clothes are pure combination of pure girlishness with an edge. And, I am a sequin whore. 2| Why do you make/design things? I really enjoy the design process from beginning to end. I get a great sense of accomplishment over my designs. Every.Single. Time. It’s just part of who I am. I grew up as a competitive dancer, so the creative process has been instilled in me since I was like, two. No, seriously…. 3| What do you love about your job? I love that I have the opportunity to work for myself. It’s a blessing and a curse sometimes, but I can’t imagine doing anything else. I love that I get to call all of the shots. I like having my hands on all aspects- design, production, photo shoots, all of it. Seeing my business grow slowly but surely is a really great feeling. 4| Was being a working artist always your plan or was there an “aha” moment? I think that I’ve always had an entrepreneurial spirit. I’ve never really enjoyed working for the M-A-N. I’ve been there, done that and it just wasn’t for me. Us creative folks don’t strive in 9-5 gigs. It just doesn’t work. 5| How do you work, and where? LOL. By the seat of my pants, I’m afraid. I’m trying to master the art of designing a season ahead, but I have yet to get that far. It would mean giving up a season to do so and that frightens me. I work out of my house and have a pretty great space in my basement that’s about to be gutted and made more fab. 6| If you could swap lives with another artist and live as them without anyone knowing that you were really you and not the other person, who would that person be? That’s an incredibly difficult question, but I think I would have to go with Isabel Toledo. Her drawing aesthetic is something that has inspired me from Day One and her clothing collections are such an ode to that. Plus, she seems like a cool broad. So, why not? 7| What makes a handmade object valuable? All of the blood, sweat, and tears put into it. In this day and age where everything is made from China, of plastic, and falls apart within hours, it’s refreshing to have pieces that are truly handmade. People put their heart and soul into their creations, working meticulously to make something of quality and meaning. 8| Using that definition, what’s the most valuable object you own? Probably my mustard yellow velvet tufted sofa. For years, I searched high and low for one, but they were either too expensive and cheap looking or just not exactly what I wanted. My neighbor volunteered to make me one and it’s fantastic. I always think about how if there was ever a fire, how I could get it out in time because it’s heavy. And, gorgeous. 9| In your collection “Strangeness and Charm” you have some stunning pieces made from hand dyed silk. Tell us about the silk dying process. How do you get the splattered look? It’s definitely a process for sure! I start with a simple white silk that serves as a blank canvas then dye the base color once, twice, three times, maybe more depending on the desired color that I’m trying to achieve. Once I get the color the way I want it, I hang the silk out in its entirely, serving as a gigantic canvas. I like to keep the second process as organic as possible because it makes the garment, once constructed, individual in its own right. I splatter the dye in a Pollock kind of way. It make seem like there’s no rhyme or reason to it, but there is. 10| What is the best piece of fashion advice that you follow? To follow trends, but interpret them in your own way. Just be an individual and yourself. It’s so cheesy, but also the absolute truth. 11| What is the most exciting thing about fashion? What I enjoy most is watching the development of new design techniques and silhouettes transpire. Trend forecasting is one of my favorite things about being a designer. It’s a personal victory when you predict things before they start gaining mass attention. I’m like that with everything, though. Particularly music. I love finding artists before they make it big. First Aid Kit is a prime example. 12| Your Lilac Moto Jacket is amazing. What a stunning juxtaposition of “male” and “female” aesthetics! 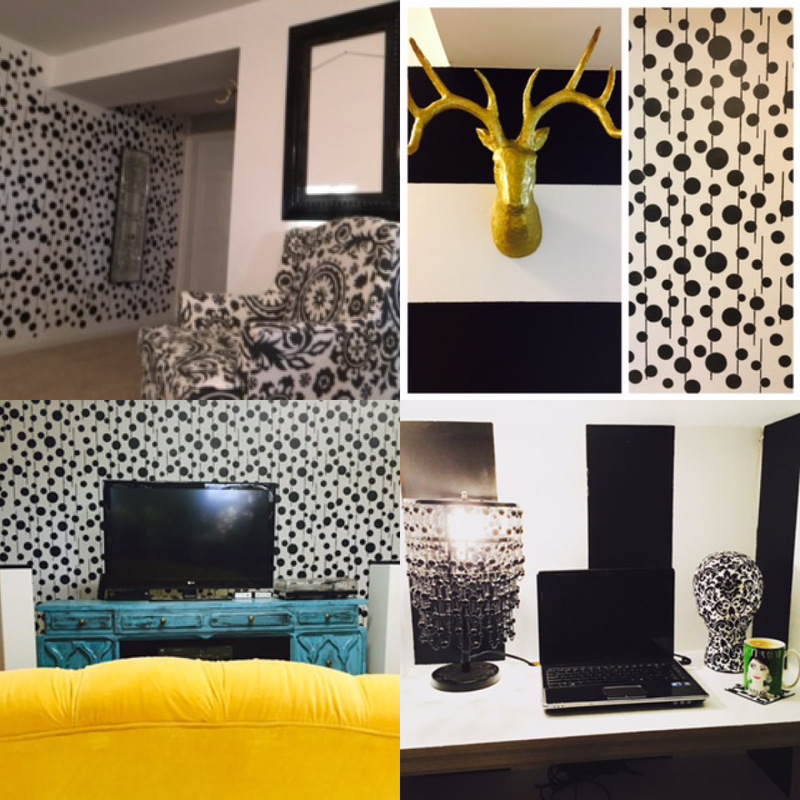 What was your inspiration for this? That jacket is one of my favorite pieces that I’ve ever made. I wanted to create something that was hard, but soft. Rock and Roll with a bit of an ethereal undertone. In regards to construction, I’m a sucker for difficult fabrics. I love the challenge of working with fabrics that are notorious a**holes. With the lilac Moto, I used imported leather from London paired with silk organza. Incorporated French and Bound Seams. I love that piece with all of my heart and actually made a more affordable version for all of my boutiques using fleece and vegan leather. Also, a hit. 13| Tell us one true thing about yourself that people don’t believe when you tell them. I’m actually extremely shy. I just put on a really good front. 14| Give us three more non-crafting-related details about you or your life. -Fun facts of me…ha. Well, I’m terrified of bees. And, wasps. And, hornets. Essentially, anything that flies and has a stinger. I can’t handle it. If there’s one five feet away from me, I still run away like a bat out of hell. -I was once a semi-professional cheerleader (even though I hate that word because we were clearly dancers and did ZERO cheering). -When Florence + The Machine first came on the scene, she did a concert in Saint Louis and we decided to stalk her outside after the show was over to maybe get a glimpse of her. Well, we met her. She complimented my outfit and said, “I like your style”. I then floated away on a cloud for several days. We’ve got re-freshed shelves and lots to look forward to on the calendar! 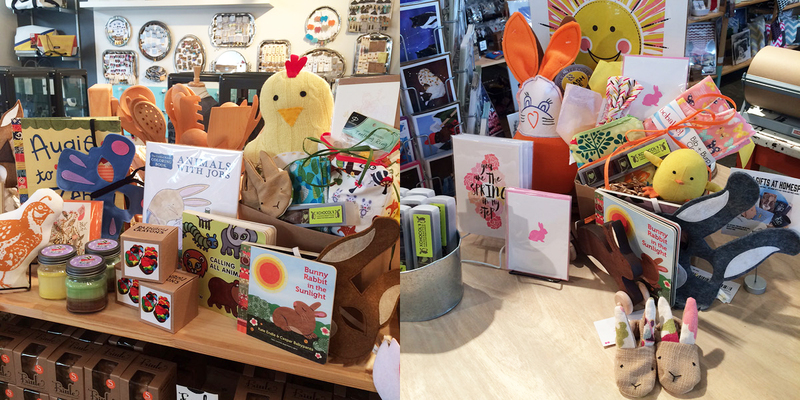 Come on over and get the sweetest additions for your Easter baskets. 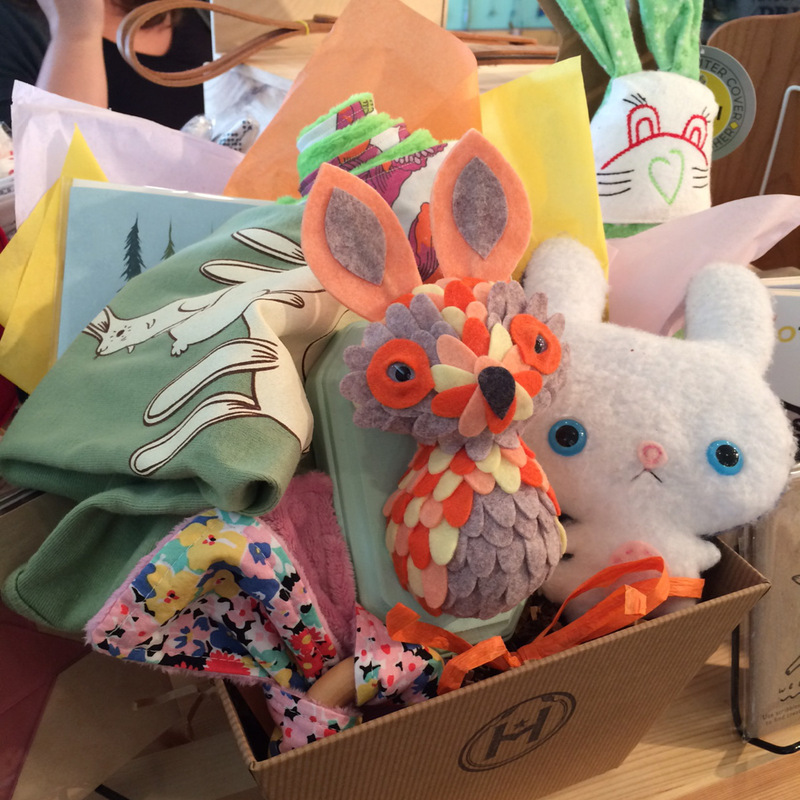 Sweet Easter baskets ready to shop and go! 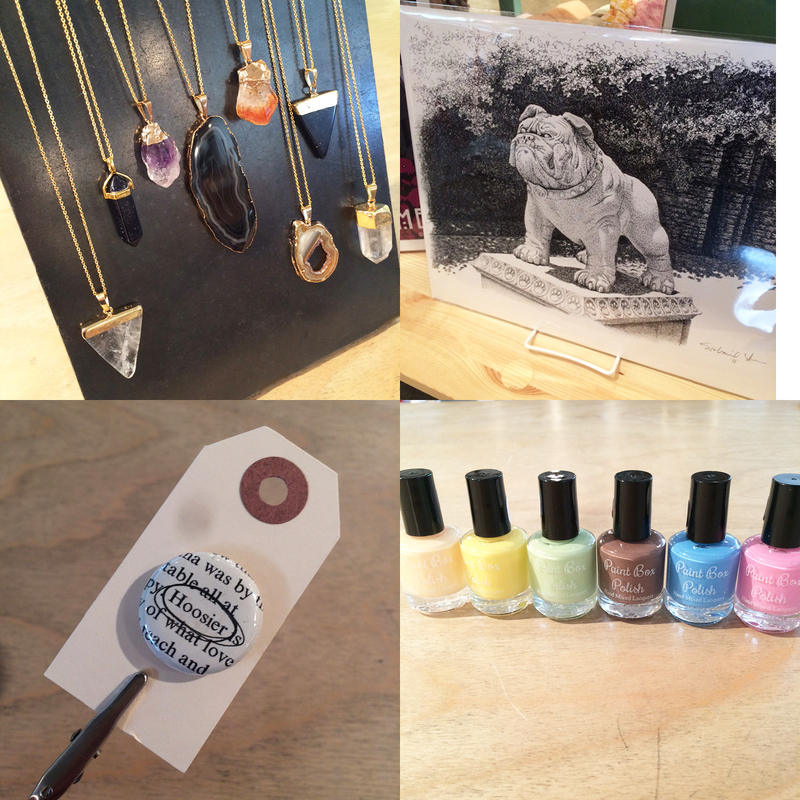 Necklaces from Paperish Mess, new Butler Bulldog print and restock in prints from HuberArt, Hoosier magnet also from Paperish Mess, and brand new line of Spring polishes from Paint Box Polish. 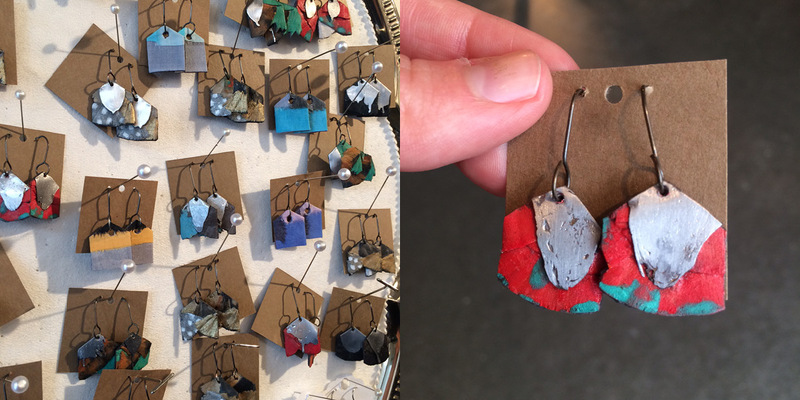 New paper shaving earrings from Paula Routsong, some of these feature a sweet metal accent. Come see all the varieties! 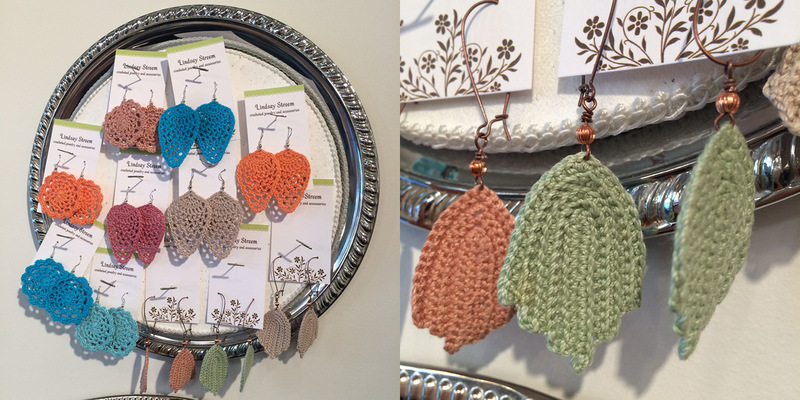 Beautiful new crocheted earrings from Lindsey Streem Designs. Bird lovers unite around this gorgeous shelf display! 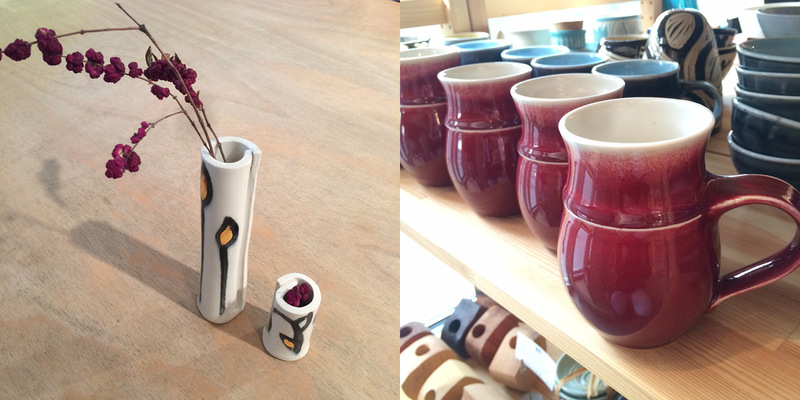 Pretty little bits of Spring found in these bud vases by Sarahmics and mugs by Raging Bowl. This is our Events Coordinator and social media specialist Rachael. 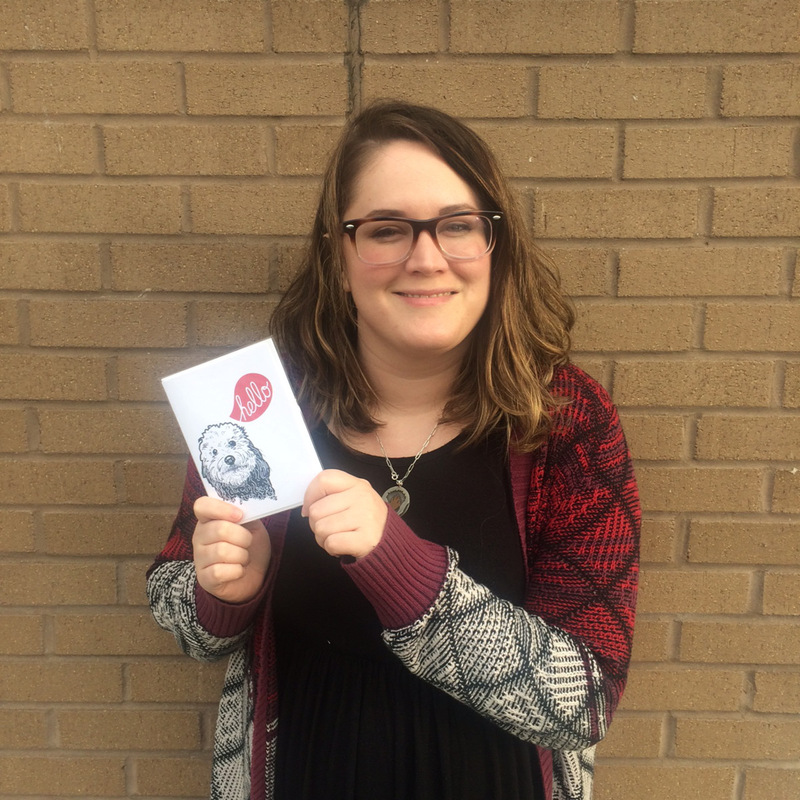 She loves the Hello (Golden Doodle) greeting card by Kate Brennen Hall because “the golden doodle on this card looks exactly like my family’s labradoodle, Fluffy (or Sweetie Pie, depending on who you ask). Whenever I need a mid-shift pick-me-up, I steal a glance at her sweet face.” Awww. 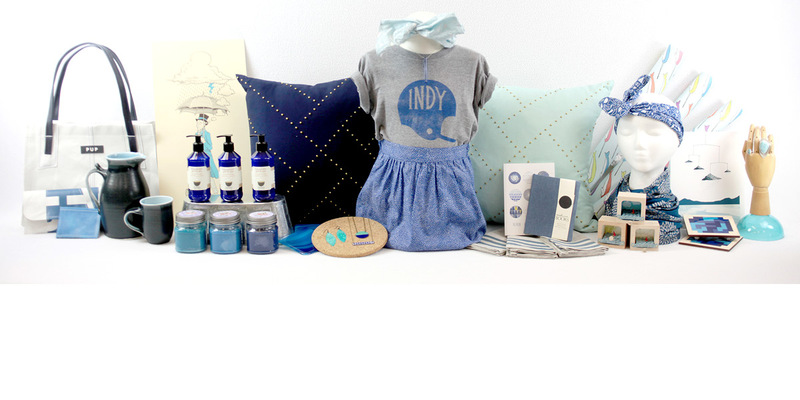 Fountain Square Music Festival: Saturday, March 26th, 10am-3pm: It’s Girls Rock Family Day at Fountain Square Music Festival, and you’ll find us in the Fountain Square Theater Building vending our handmade goods from 10am – 3pm. Bring the family to this all-ages event with highlights including a coloring station, art, on-stage performances, design-your-own-45-record, musical petting zoo (instruments set up for anyone to use), music robots, DJ performances, face painting, instrument making, and more. Don’t get pinched on St. Patrick’s Day this Thursday! 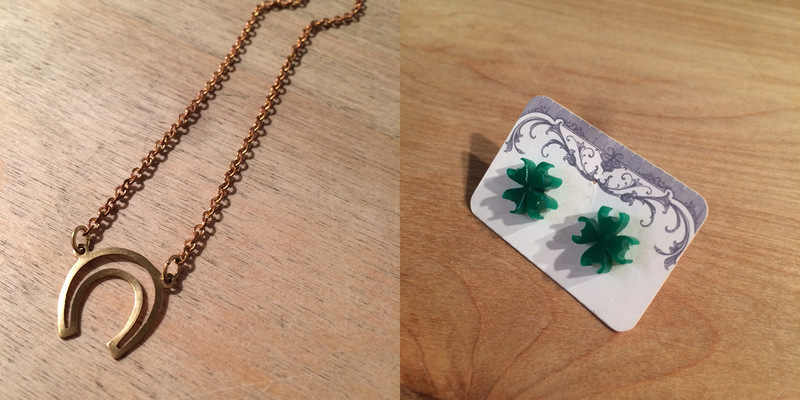 We’ve got you covered for green colored pinch-protection and handmade lucky charms, too! Keep scrolling for info on all of the local Indy celebrations. 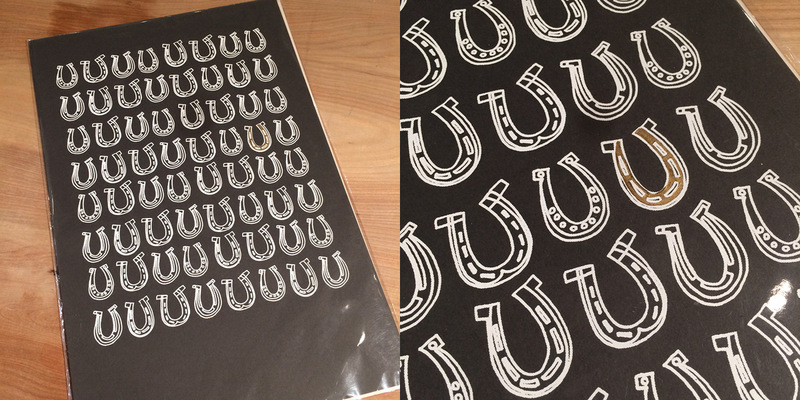 Lucky Horseshoe print by Pine Street Makery. 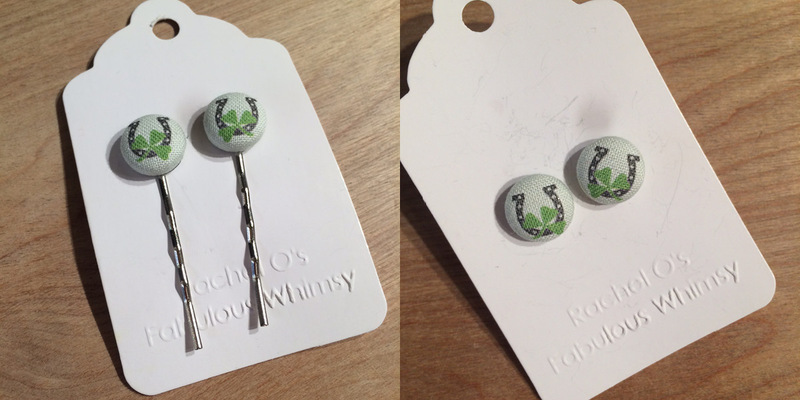 Hair pins and button earrings by Rachel O’s Fabulous Whimsy. A little sip for your lips! 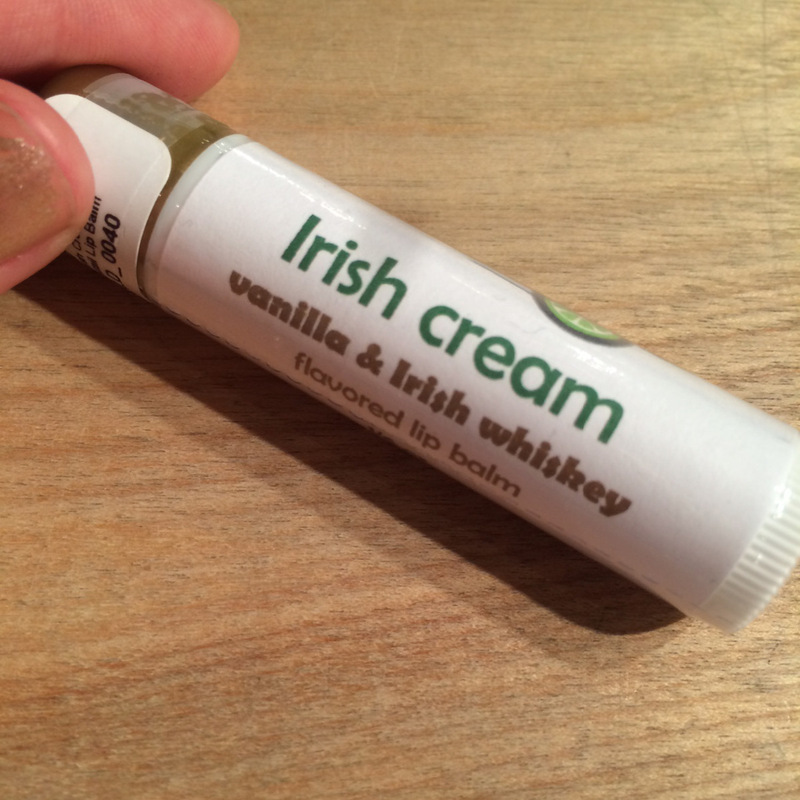 Lip balm by Aromaholics. 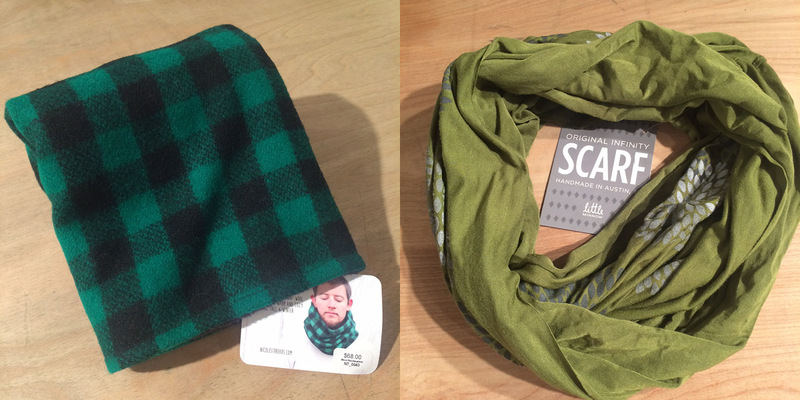 His and hers: scarves by Nicole’s Threads and Little Minnow. Horseshoe necklace by Larissa Loden and earrings by Issette. There is so much going on in Indianapolis, it’s crazy! Hope you have the luck ‘o the Irish today!